My husband died at around 3 AM the morning of Feb 26, 2009, of congestive heart failure. The page will continue if its readers/contributors continue to send in stories, and his staff can select and post them. The memorial gathering will be at 1 PM on Sunday, Mar 8 at Asian Star Restaurant, 1198 Pasadena Ave S, South Pasadena, FL. If any anyone is desirous of coming, and has no lodging arrangements made, I will be happy to help defray expenses while here in any way that I can. John Demarest Bryant was born October 26, 1943 in Washington DC, the son of Lyle C. Bryant and Nola I. Wingo. After graduating from Columbia Military Academy, Columbia, TN in 1961 and (after first attending Antioch College, Yellow Springs, OH) American University, Wash DC (BA in Math) in 1968, he and his wife moved to San Francisco, CA, where he completed the manuscript "Systems Theory and Scientific Philosophy", and found a publisher for it. Moving back to the East Coast, John delved into commodities trading in and around Philadelphia, PA. He re-found his niche as a writer just before moving to the Tampa Bay area in Dec of 1995. 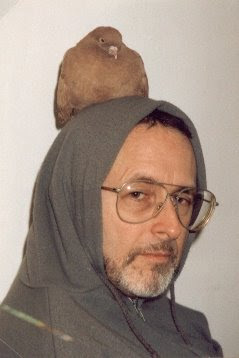 He was the creator of the website "thebirdman.org" and originator of the weekly (by subscription only) newsletter called the Birdman's Weekly Letter (now discontinued). He also wrote approx. 40 books, from the "Everything You Wanted to Know ..." (Mortal Words) series to "Better than Shakespeare", a rewrite of the major Shakespearean sonnets. He assembled a Libertarian Cartoon book, with original cartoons, many of which appeared originally in Instauration and other magazines of the alternative press. I'm sorry old Birdman is gone. I didn't see the world in the same way but he struck me as honest. He wasn't afraid to give his critics a forum if they wanted it. He had a broad spectrum of knowledge and had an interesting take on most subjects. He felt strongly enough about our plight to run the blog and offered some thought-provoking suggestions for a solution to it. He struck me as an optimist overall. My deepest sympathies to Mrs. Bryant and family. I'm a big fan of The Birdmans writing and consider him to be a kindred spirit. He will be sorely missed, but we will continue our fight against the White hating liberals and the scum at the St. Pete Times. I dont get to this side of the internet much, but to his fans and widow my sympathy at the passing of this little known, but influential writer who went by the pen of The Birdman.